Bryant McIntosh dribbles the ball. 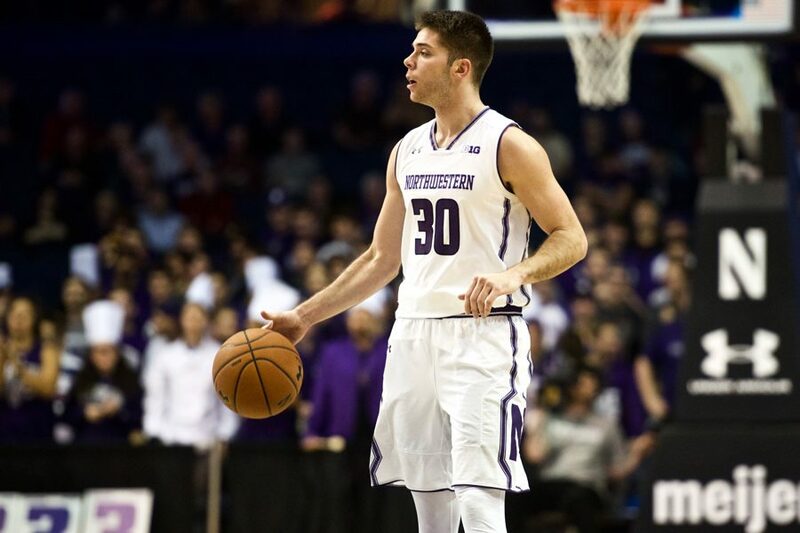 The senior guard's return from injury Friday wasn't enough to get Northwestern past Penn State. With matchups against two of Big Ten’s three worst teams from a season ago to start the 2018 calendar year, Northwestern seemingly had a golden opportunity to jump out to a 3-1 start in conference play. But the Wildcats (10-7, 1-3) were instead manhandled on the interior all week long and suffered a pair of double-digit losses — first to Nebraska on Tuesday, then again Friday at Penn State in a 78-63 defeat. The Nittany Lions (12-5, 2-2) physically dominated NU, racking up a 48-18 differential in points in the paint. For every missed layup, bricked Scottie Lindsey shot or turnover (of which the Cats committed 15) on the offensive end, there was a wide-open dunk or layup for Penn State on the opposite end of the court. Senior guard Bryant McIntosh scored a team-high 18 points for the Cats in his return from a brief injury absence, but his efforts were easily overshadowed by Penn State’s Lamar Stevens, who set a career high with 30 points on an absurd 14-of-18 shooting line. The matchup between the two starting centers — junior Dererk Pardon for NU versus Mike Watkins for Penn State — quickly devolved into a mismatch as well. Watkins scored 18 points, hauled in 17 rebounds for the second consecutive game and committed just two fouls; Pardon tallied only 6 points, brought down just four rebounds and fouled out in the closing minutes. McIntosh, who injured his knee in an ugly-looking collision last weekend against Brown, said afterwards that he felt fine health-wise. With the Cats trailing 30-15 slightly past midway through the first half, television cameras captured Collins imploring his team during a commercial break to fight harder for loose balls and put more effort into the game. The pep talk seemed to work to an extent, and by halftime, a banked-in 3-pointer by McIntosh had cut the deficit to 41-34. NU continued to show flashes of a potential comeback early in the second frame, and back-to-back treys by McIntosh and junior guard Jordan Ash pulled the visitors within 3 points with 15 minutes to play. Then the bottom fell out. The Nittany Lions erupted on a 9-0 run — composed exclusively of dunks and layups, plus one free throw — to restore control, and the Cats never again seriously threatened. For the second consecutive outing, NU shot extremely poorly from the field, following up a 29 percent performance against the Cornhuskers with a 37 percent rate in State College. And leading scorer Lindsey, with his 3-for-17 mark Friday, remained the poster child of those woes.